We found a match between supra-long Scandinavian pine masters and a long oak chronology from Denmark (WestDK, with known start and end dates) in our recent investigation. The match confirms the dating of WestDK. 1a. What do we know about WestDK oak? All we have is a mean value curve and we do not know the internal replication, so as referee 6. says, there might be problems with low replication at certain times. But we know for sure the end year of the chronology (1986), and we have checked the oak to oak match against other - of us verified - European oak curves. E.g. there is a good, visually verifiable match down to 383 against HollsteinRecent. So let us assume that WestDK is sound over its whole length, and that it is correctly dated. 1787 years, 200 to 1986. 1b. What do we know about Torneträsk pine? Neither in this case we know the internal replication, but the match against FinlandPine is without doubt, and that chronology we have checked at single sample level. 7317 years, -5319 to 1997. Result question 1.: We have two trusted curves with known start and end dates, and we know the overlap of these curves, 1787 years. This is important, because even if the match gets weaker, we know the right synchronous position for each single year. Let's check if there is a match between the curves. We set the "least overlap in years between samples when correlating" to 1700, select Hollstein normalization and sort by t-values. Torneträsk as reference. The best match is 1986 (as dated), corr. coeff. 0.16, t=6.7, well discriminated against the next best match at -1322, corr. coeff. 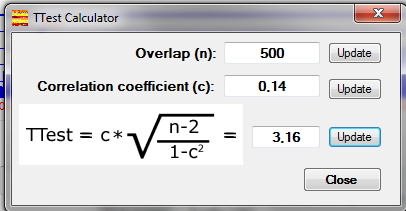 0.10, t=4.3. Figure 1: WestDK oak against Torneträsk pine as ref., Hollstein normalization, later times. The red figures under the trend bar on the curve diagram are the corr.coeffs. of the blocks. Note the block parameters in the lower left corner of the diagram (red oval). Click on the diagram to see details, go backwards one page to close the diagram. We have extremely good correlation (for an interspecies match over long distance) for the latest 500 years, but not that bad at all for additional 500 years. Before that the correlation is weaker, but still clearly apparent. Figure 2: WestDK oak against Torneträsk pine as ref., Hollstein normalization, older times. In the "Piled correlation diagram" below, we show all the (positive) correlation values (correlation coefficients (red piles) and t-values (blue piles)) for each of the 5703 possible synchronization points between the sample curve and the reference curve. The true synchronous position (1986) has in this case the highest "pile", and it is well above the next highest peak (-1322). This is what we call "well discriminated". Figure 3: WestDK oak against Torneträsk pine as ref., Hollstein normalization, piled correlation diagram. For generation of this diagram, see that Settings/Enable crossdating quality test functions is checked in CDendro. Also note the CDendro settings in the red oval. Use the toggle-button Show/Close to open or close the diagram. Do notice the well discriminated true synchronous match with T=6.7, visible near to the right margin. The 5702 false matches are all well below a "noise threshold" of t=4.5. Result question 2.: WestDK definitely has a significant synchronous position where it should, but the match is not time-stable over its whole length as referee 6. has pointed out. This is probably due to low internal replication in either WestDK or the reference, or both. Nothing we can do about at the moment. We have to ask why there is a teleconnection between species at all, maybe weather systems are similar and vegetation periods for oak and pine are congruent for northern Scandinavia and NW Europe, but this question alone is material for a doctoral thesis. In Figure 3 we see the reason why a moderate match should have at least a t-value=4.5: there are quite a lot of false matches around t=4 ("noise"). 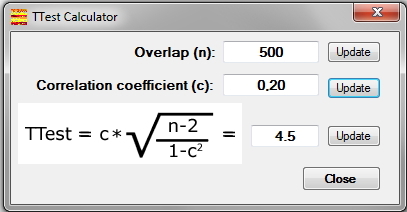 This parameter is about the same regardless length of sample or reference curve, which can be demonstrated experimentally. To be on the safe side, we require at least a t-value = 6 (two units above "noise level") for a significant (i.e. unique) match. Also this parameter is the same regardless length of sample or reference curve (however a lower limit for the sample length exists), please see also our method section "What is a good TTest value?" To calculate the minimum criteria for each block if we want to perform a block analysis, we have to pretend for a moment that the match is time-stable. We see above that a t=6 is sufficient to provide discrimination and significance. With a total length of 1787 years overlap, the correlation coefficient has to be only 0.14 on average to fulfil this criterion. And this means also that each block of 500 years only needs to reach t=3.2 to give a corr.coeff. 0.14. On the other hand, the criterion t=4.5 (moderate significance for each single block of 500 years) requires an average corr. coeff. 0.20. This finally means that this requirement (corr.coeff. 0.20) results in a t-value of 8.6 for the total overlap of 1787 years, and this is plainly too much if we just want to reach significance. Nice to have, but can we really expect that performance of an interspecies teleconnection? Result question 3.: To reach a significant match of WestDK oak against TorneTräsk pine, a t-value = 6 is sufficient. 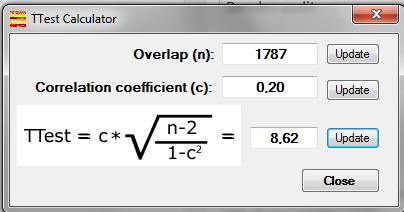 This also means that an average minimum correlation coefficient of 0.14 is sufficient as the overlap is 1787 years. Seen from the above perspective, the match of WestDK against Torneträsk is fully significant over the latest 1000 years, and before that it is not far from significance (corr. coeff. 0.11 instead of required 0.14). This conclusion can be derived from the block analysis shown in Figures 1 and 2. When is it relevant to perform a block analysis? Firstly, if the complete overlap to be considered only shows a "moderate" match a little over t=4.5. Then you might and should require an extra check to verify the match with statistical methods. Secondly, if the internal correctness of the sample is unknown. But both criteria are not really relevant in this case. WestDK has been verified against other oak masters, therefore an error in the dendrochronology can be excluded. On the contrary, the significant match between WestDK oak and Torneträsk pine actually verifies both curves for the overlapping period. This would be a proof that there are no missing rings in the European master tree-ring chronologies due to e.g. volcanic forcing as proposed by Mann et al., besides the recently observed global radiocarbon anomaly at AD 775 which still has to be demonstrated for Torneträsk (refs. 1, 2). Result question 4.: The match of WestDK against TorneTräsk appears at the expected position and fulfills the minimum requirements for a significant match. Note: WestDK also has a significant match against FinlandPine, corr. coeff. 0.14, t=6.0. If TorneTräsk and FinlandPine are combined as the reference, the match of WestDK is strengthened (corr. coeff. 0.16, t=6.8), especially at the old end. The Torneträsk raw data was published in 2014 on the ITRDB. We have now written a paper about our validation of both supra-long pine tree-ring chronologies from northern Scandinavia, which is available here.